Could Too Much Iron Contribute to Your Risk of Developing Gestational Diabetes? According to a new study, there may be a link between high iron levels and gestational diabetes. A study from a team of researchers at the U.S. National Institute of Child Health and Human Development have discovered a link between high iron levels and an increased risk of gestational diabetes. This raises an important question: Should women routinely be advised to take iron supplements? According to the study's findings, women with very high iron levels during their second trimesters of pregnancy had about twice the risk of developing gestational diabetes than the women surveyed who had very low iron levels. But let's not forget that while these findings found reason to believe a link may exist, they don't quite prove a cause-and-effect relationship. Researchers looked at 107 women who had gestational diabetes and 214 women who did not. This is certainly a small sample, but researchers believe there's something to these findings. "Our study findings raise potential concerns about the recommendation of routine iron supplementation among pregnant women who already have sufficient iron," study author Shristi Rawal said, according to HealthDay. "The women who were in the top 25 percent for levels of ferritin in the second trimester had almost four times the risk of gestational diabetes, compared with those in the bottom 25 percent." How could this happen? One theory is that iron may contribute to an increase in oxidative stress, which could damage pancreatic cells—these cells produce insulin, and if they're damaged, it could affect the body's insulin function, which could lead to gestational diabetes. Major health organizations are at odds over whether or not all pregnant women should be advised to take iron supplements. The American College of Obstetricians and Gynecologists suggests screening pregnant women for iron deficiencies and advising regular supplements if they appear iron deficient, according to a release for this study. 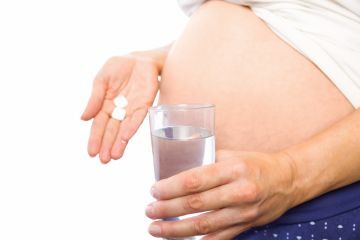 On the other hand, World Health Organization and the U.S. Centers for Disease Control and Prevention are in favor of routinely recommending supplements to pregnant women. It's a delicate balance: While excessive iron may lead to gestational diabetes risk, sufficient iron levels are crucial, as they aid in development of the fetus's brain. What should you do this with this information? As always discuss it with your doctor if you're concerned—and having your iron levels checked might not be a bad idea.